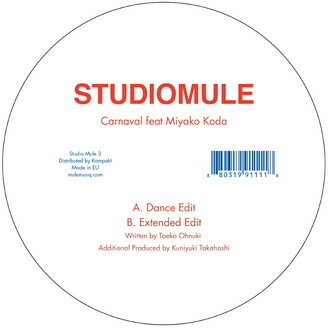 the first release of our new project “studio mule” is a cover of japanese 80’s dance classic “carnaval by taeko ohnuki”. is studio mule a band? unit? we never have fixed member except kuniyuki takahashi as a track maker. we invite who we love. the first gest is our beloved miyako koda aka dip in the pool.you remember the reissue of “on retinae” on music from memory. miyako koda is one of the most carisma model in japan in 80’s and the vocalist of experimental pop band “dip in the pool”. dance edit on a side is true to the original.off course more playful than original. extended edit on b side is more club friendly house version.